An OEM that manufactures large power supplies (over 3 Megawatts) has harmonic issues that are created by the system. These power supplies have a Silicon-Controlled Rectifier (SCR) bridge to generate and regulate power for heat treating and hardening. These large rectifiers cause significant distortion on the power line if left unmitigated. The effect can cause serious damage to neighboring power consumers, causing disturbance to various electronics such as computers, televisions, telephones, and stereos. A standard harmonic filter capable of several thousand amps is not readily available, and to custom design a filter at this power level would not be practical. The harmonics created by these power supplies can affect residential homes in a nearby subdivision causing the electric utility company to shut down the heat treating factory. patent pending adaptive passive technology, provides superior harmonic reduction over a very wide operating load range. Less than 5% total harmonic current distortion THID is achievable at 45% load. Working with MTE, the OEM developed methods for parallel buss-work and cooling to maintain the integrity of the filter, thereby achieving the desired results. Working with MTE, the end user was able to achieve the required reduction of the overall harmonic distortion. The secondary distortion that might have affected the local residence was no longer a problem. Paralleling harmonic filters was a cost effective solution for the end user instead of creating a large custom designed filter. Simple, robust power quality solutions that are never over-engineered. Power quality management requirements vary significantly. By utility. By industry. By application. By country. By site. That is why we offer a variety of power quality and filter products, for both input (line-side) and output (load-side) of Variable Frequency Drives (VFDs) and power conversion equipment. These components represent strategic parameters of power quality. We can provide you with a complete power quality solution. Our line-side solutions protect against voltage spikes, noise, and nuisance tripping. Our load-side solutions protect against voltage peaks, reduce audible motor noise and extend motor life. The Matrix® AP is the most advanced passive filter on the market to meet IEEE-519. Its patented Adaptive Passive Technology adapts to varying loads to viturally eliminate harmonics. 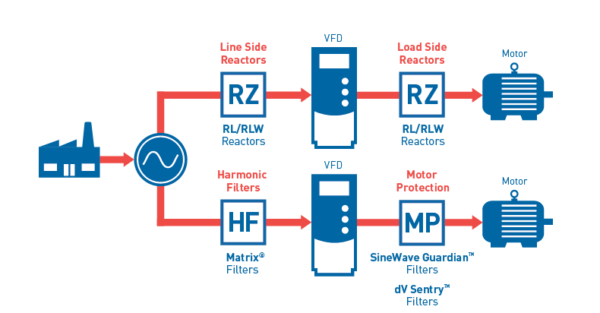 RL and RLW Line/Load Reactors help keep your equipment running longer by absorbing many of the powerline disturbances which otherwise damage or shut down your inverters, variable speed controllers, or other sensitive equipment. 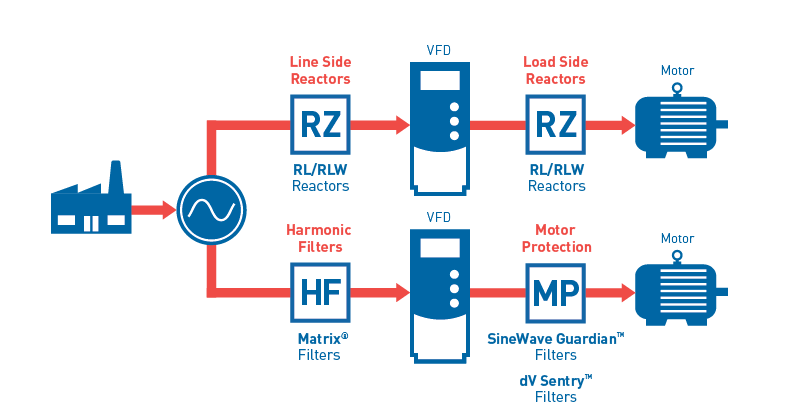 The best-in-class SineWave Guardian™ cleans up the PWM waveforms generated by VFDS. It virtually eliminates high frequency content and voltage peaks to reduce motor downtime. The dV Sentry™ and its patented Triple Defense Core is proven to reduce common mode, protect against peak voltage and reduce rise time – all in one unit.